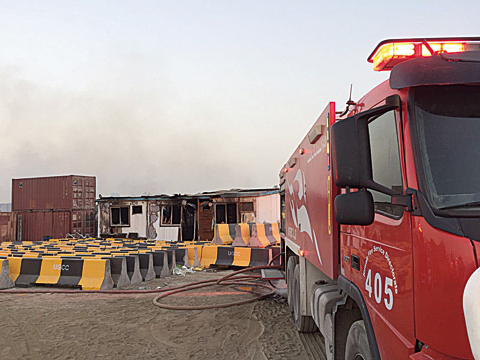 KUWAIT: A fire engine is seen at the site of a fire reported in Kabd yesterday. KUWAIT: Fire broke out in Kabd area chalets containing furniture and electric equipment. Firemen from the Kabd, Jleeb Al-Shuyiukh and back up fire stations responded and put out the fire. No injuries were reported in the incident, as an investigation was opened to determine what caused the fire. Hawally municipality removed 191 encroachments on state property, handed over 194 warnings for encroachment, and removed 880 violating ads from streets and open yards during their recent campaigns. Police may press charges of attempted suicide, public indecency, drunkenness and public disturbance against a man who reportedly climbed to the top of a school’s fence, got his clothes off and attempted to jump in a bid to kill himself. Police received a call from a private school in Khaitan, telling them that a naked man climbed to the top of the school’s fence and was threatening to commit suicide. Police were able to get the citizen down and arrested him. The man was in a bad condition, so he was taken to hospital and given a sedative to calm him down. A citizen was rushed to Mubarak Hospital under police’s guard after he was found unconscious inside a mall’s toilet, and doctors confirmed that his condition was due to drug abuse. An empty bag containing traces of drugs was found inside the toilet.